There are a lot of reasons why hair-loss happens. The causes may vary from auto-immune issues to post-trauma events - or perhaps following chemotherapy. At Paradigm, we will determine the cause of your hair-loss before we embark on any treatment. We will also look at projected future hair-loss and the pattern and trajectory of that future hair-loss. The vast majority of patients coming to Paradigm with hair-loss will find that it occurs naturally through a process known simply as ‘pattern-hair loss’. Because this ‘pattern hair loss’ (also known technically as ‘androgenic alopecia’) has a complex transmission through families, it is less predictable than other more commonly-known hereditary conditions. Through the consultation and assessment process, I will be able to diagnose the specific reasons for your hair-loss. This is an important element in determining future hair-loss patterns. We will use this information to create your bespoke transplant, or transplants, at Paradigm. Together, we will produce a tailor-made treatment plan which will address all of the issues relating to your hair-loss requirements, both in the here and now and in the future. While typical patterns of hair-loss have been well-documented, it is often the case that individual variations exist - and, of course, an individuals attitude to their hair-loss will always be unique. Therefore, management of a patient’s hair-loss has to be specific to them and dove-tailed to meet their unique goals and and to address their particular areas of concern. 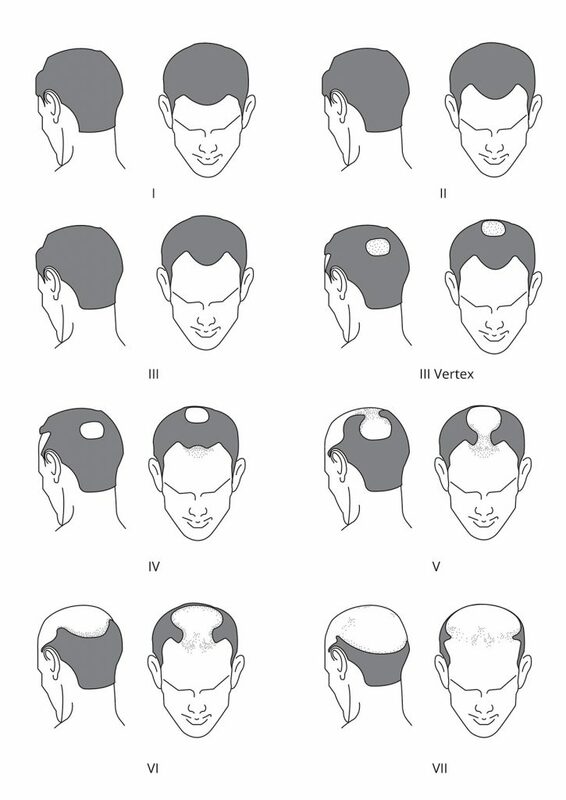 Generally, typical pattern hair loss begins with a gradual thinning of the hair, characteristically on the top of the scalp, the crown and/or thinning at the temple hairline. Important factors contributing to hair-loss are genetics and the presence of a testosterone derivative dihydrotestosterone (DHT). The passage of time is also another significant factor. And while folklore has it that one inherits baldness from the mothers side, this is inaccurate and, in reality, the predisposition is inherited from both paternal and maternal sides of the family. Folklore also suggests that testosterone on its own is responsible for hair-loss. Once again, this isn't the complete picture. One of the derivatives of testosterone mentioned above, DHT, has been implicated in male pattern hair-loss - but those patients who exhibit male pattern hair loss do not have increased levels of testosterone compared to those who don't exhibit hair-loss. So its a relatively complicated picture with no clear-cut answers. Testosterone is converted to DHT in the body by a process involving the enzyme 5AR (5 alpha-reductase). DHT plays a major role in hair-loss. Some of the therapies addressing male-pattern hair-loss aim to reduce the rate of this conversion so that there will be less DHT available within the cell. But to date, the exact physiological role played by DHT is unclear.